This show features the Matisse-like gouache and acrylic paintings of Nancy Swisher. She calls her work “Art That Elevates.” Using vibrant colors, Nancy captures the beauty and truth of narrative moments in a style that is heartfelt and honest. Nancy has a natural gift for color, and the palettes she uses in each painting create a wonderful dance across the paper or canvas. She has been in love with color since she was a toddler standing in her mother’s flower garden. Nancy’s intention with her art is to convey the energy of happiness, love, and peace. 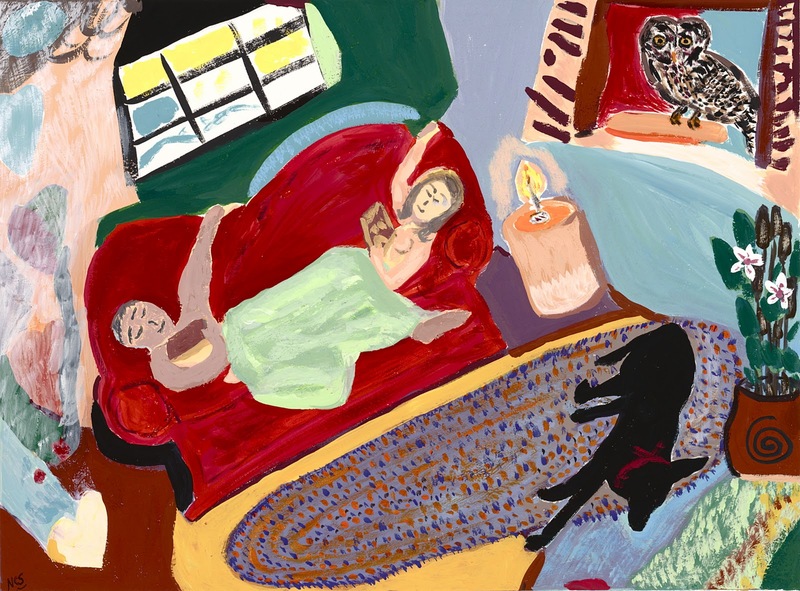 Her paintings are inviting, and the viewer enters into their open celebration of color, balance, spontaneity, and appreciation for life itself. All of Nancy’s paintings include aspects of nature, especially birds and animals, to honor the spirit that connects everything. Those who have her work hanging in their homes all say the same thing: “I look at your paintings and I suddenly feel happy.” Everyone is invited to come up to Flying Leap and be elevated by the delightful presence of Nancy’s work. Some of Mikaila Maidment’s beautiful paintings will remain in the gallery as well, along with a few other new additions by other artists.